Here in Home Design Lover, we like showing off pictures of spaces in the house with the coolest color combinations ever! 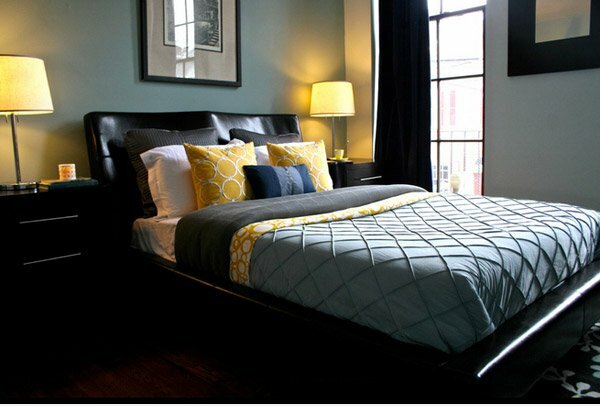 Today, what we have in stored for you guys are bedroom ideas. Before, we have lists of bedrooms with one single major color used – but for today, the list we have is about 15 Gorgeous Grey, Turquoise and Yellow Bedroom Designs. This combination works, and you will see that in the next pictures. 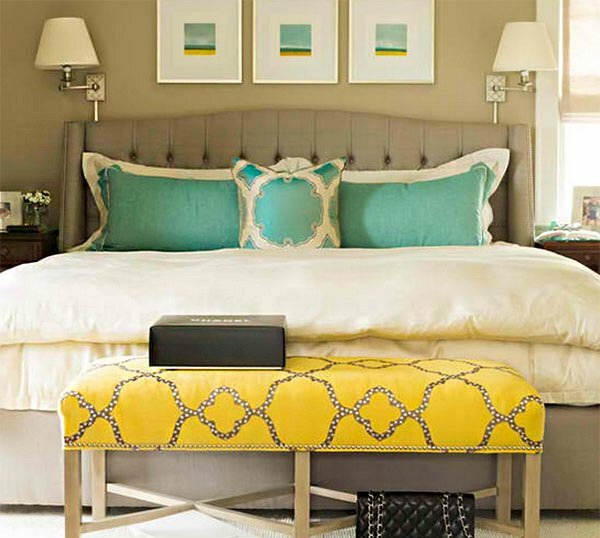 But take note that turquoise and yellow is a great combo, oftentimes bold, but works – today however, we chose bedroom designs that capture the boldness of these two colors which is then neutralized by the color grey. 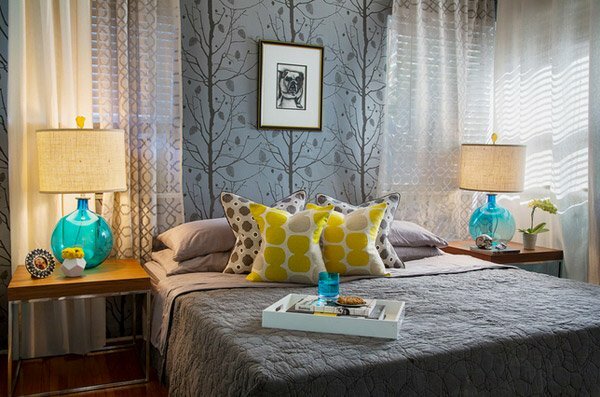 Sit back and relax guys, and enjoy the 15 Gorgeous Grey, Turquoise and Yellow Bedroom Designs, have fun! 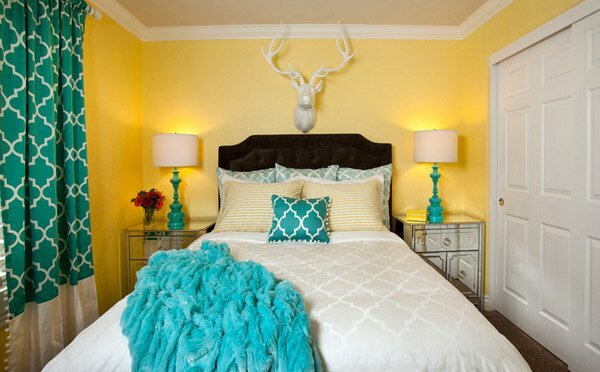 Yellow is the main color used for this bedroom and adding turquoise made it a match made in heaven! The grey carpet evened out the combo. Look at how awesome this Portland bedroom is! 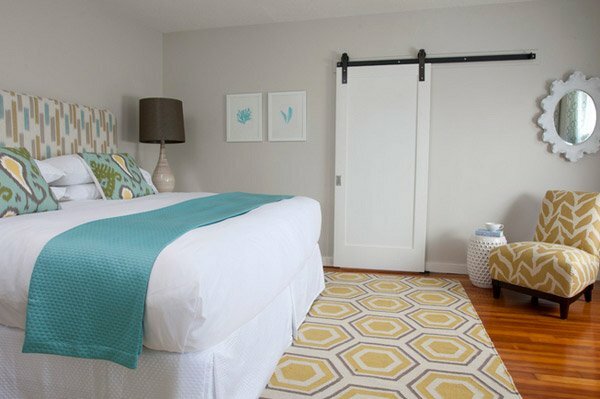 Nifelle Design did a great job in conceptualizing this bedroom design as it is which is totally lovely! This Portland home used light blue walls and turquoise chairs to beautifying bedroom, the yellow throw pillow accented the room. This room may be small; but this room is in Las Vegas! Believe it! Small, pretty and sparkling! Looking for the turquoise material in this Denver home? Check out the deer head on the wall! Great color combination and play of prints. Do you like it? This is one Eastern Shore master bedroom which is a bit of traditional and contemporary – killer combination, aside from the colors, we should say. 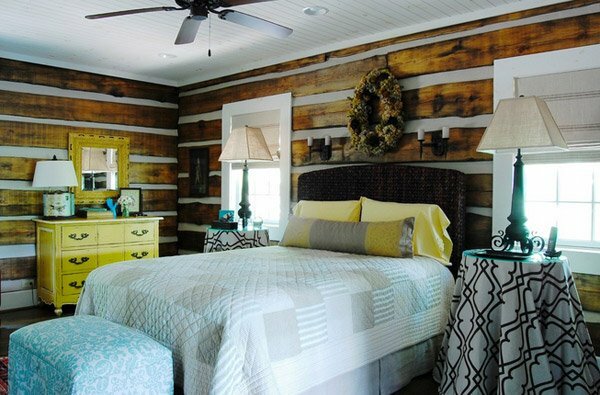 This is one Alabama rustic-inspired bedroom. The decor is stunning and pretty much interesting. The color combination mixed in with brown makes this room really catchy! Notice the subtle colors used for this bedroom – which is obviously simple but a stunner. We just love it! This is like one modern home to envy – wonderfully chosen lighting fixtures and ceiling panels – we love it! The color combination of the bed and its contents is just heavenly. This bedroom sure is beautiful. Simple decor and lighting but this one definitely has interesting prints and patterns. 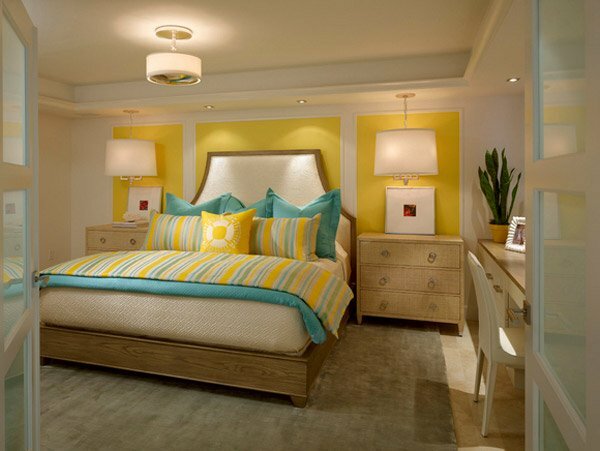 We love the awesome bedside lamps that this bedroom has! Notice that it matches the glass on the bed? Great color combo – it’s fun and funky at the same time! 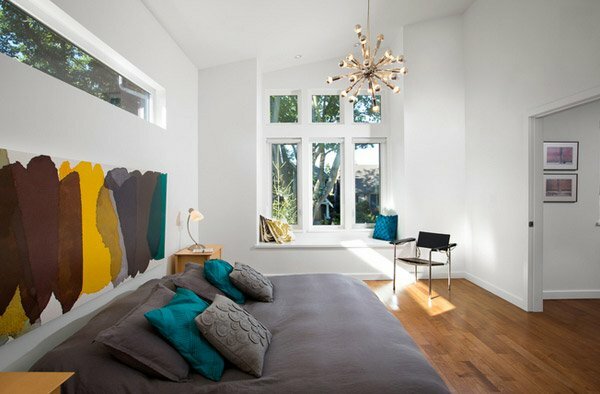 Klondike Contracting had created this wonderful Vancouver modern bedroom which we absolutely love. 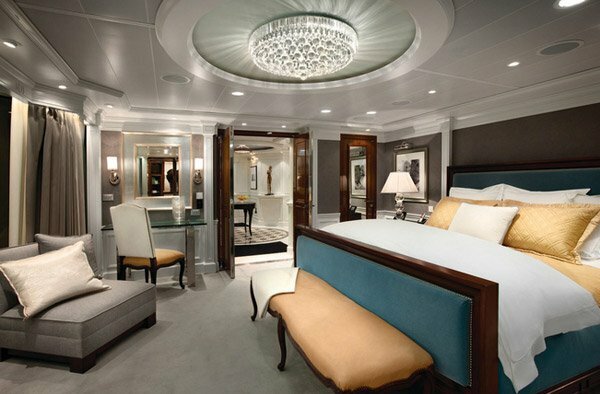 Note the clean walls that is only makes the room larger than it already is; and the colors – it’s just lovely. Another Boston home that came through for us with its stunning concept and pop culture feel. A tad eclectic, this bedroom is just fun and have so much happy colors and patterns. It’s sleek and a bit funky but totally classy. A beautiful Los Angeles home fit for royalty! 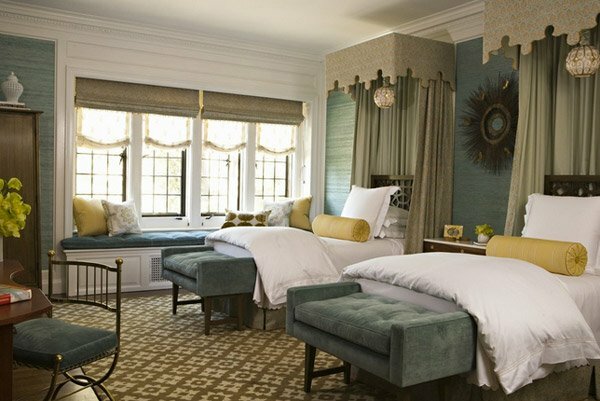 We love the design of the beds and the headboards – its crazy stunning! 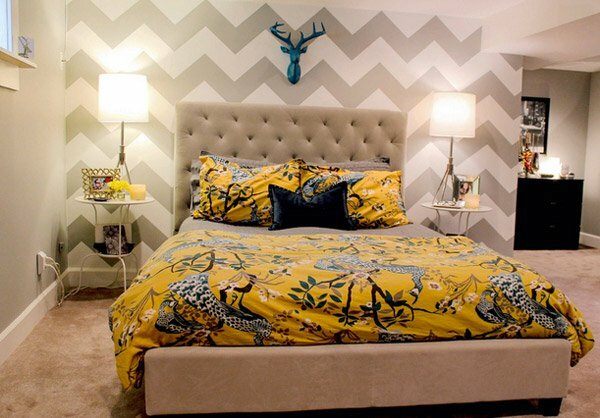 And there you have it ladies and gentlemen, the 15 Gorgeous Grey, Turquoise and Yellow Bedroom Designs. They sure were as interesting and lovely as the 15 Visually Pleasant Yellow and Grey Bedroom Designs which is of course another lovely list that you should check out again. These color combinations can go and on, so just sit back and relax. Hope you liked it.